Its that time of the year again. India Couture Week ICW 2018 just started yesterday. 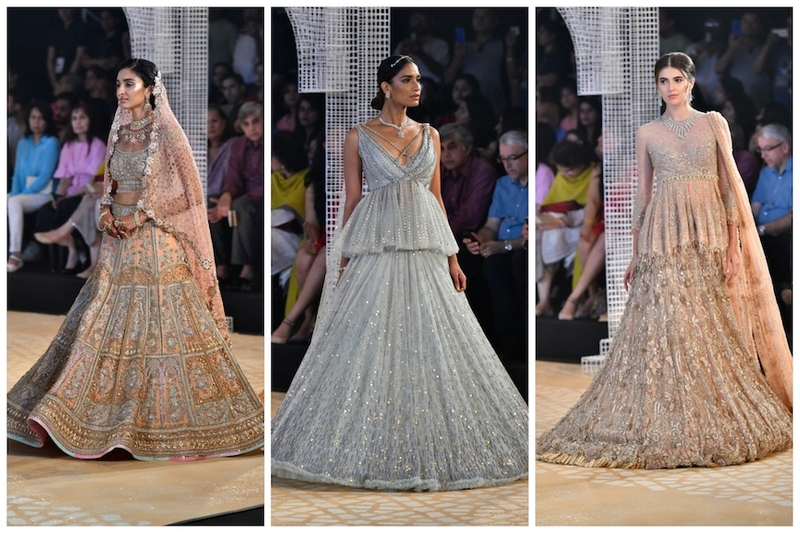 Tarun Tahiliani and Anju Modi showcased their Latest Bridal Lehenga Designs and I am in awe. Every single year, premium designers like Tarun Tahiliani and others create magical new lehenga designs never seen before. Year after year. It’s amazing to see how brides every year get to experience different styles in colours, patterns, designs and yes, the choice is going to get more and more difficult to narrow down. Tarun Tahiliani ICW 2018 collection this time features a total of 70 designs. Normally, one would see 18-25 pieces on the ramp usually, but this time around things seem to be different. Not that anyone is complaining. More the merrier I say when it comes to Indian Bridal Lehengas. Favourite red gold bridal lehenga from Tarun Tahiliani ICW 2018 collection. No matter what the new collection holds, I have always had my eyes open to see the new classic bridal lehengas. Red and Orange, even gold are colours that are symbolic of Indian Weddings. The little details of the belt, the minimal jewellery and the new criss-cross dupatta pattern is what brings this bridal lehenga by Tarun Tahiliani right on the top. All the other colours and the offbeat colours come and go, but you can never go wrong with these bridal lehengas. It thus makes more sense to see versatility in terms of designs, colour shades and just the full picture of a dressed Indian woman in bridal finery. The striking thing about this gorgeous lehenga is the way the dupatta has been draped in the blouse style. If that makes any sense. Aditi Rao Hydari looks ethereal in bridal outfits, as we have seen multiple numbers of times in the past. This time around didn’t disappoint either. The sashaying of the lehenga gown, and the slight off shoulder drape, all very dreamy magical like. Can’t wait to see a real bride wear this showstopper look. I don’t know about you. But the minute I saw this bridal lehenga, I felt the queen is walking to her royal throne. The opulence of the garment, with the mix in colours and the rich embroidery, the lehenga is the definition for exquisite. I am not really sure of the dupatta floral border, I think it’s gone a bit much. But overall, the bridal lehenga is top notch for offbeat shades. And finally, after months of work, we unveil the occasion, bridal and couture collection. The key has been to achieve lightness, after hearing thousands of women complain about being tortured in clothes they could not move in, or weighed them down. So, the new lightness, in Elysium, for modern day glamour and ease of wear. The new voice of tradition at last. – Tarun Tahiliani Source, Business Standard. Now, looking at all these gorgeous lehengas, you might wonder what do these Tarun Tahiliani lehengas cost? I totally did want to know, and you know what? I was pleasantly surprised. There are some gorgeous lehengas in premium-affordable range of 1-2 Lakhs. Sometimes even as a wedding blogger, certain things come as a surprise. This definitely falls into that category. You remember I wrote a similar post on Anita Dongre lehengas under 1 lakh? A lot of you said that was so surprising. The general notion behind premium designers is they are almost always out of reach for the mass population. But looking at these lucky pieces, I see there is hope. Now don’t think that couture pieces are going to cost you in the similar price bracket. They in all certainty will cost much higher. But if you are looking for prewedding lehengas in the 1-1.5 lakh budget range, then stopping by Tarun Tahiliani’s store is a pretty good idea. Where is Tarun Tahiliani’s Store? You can also look at some of his collection with prices on Tarun Tahiliani official website. Love-love-love this look. We Indians are naturally blessed with good curves. So flaunting it makes total sense. I know this model obviously has a bomb figure, but that flair on the bottom is sure to look good on a lot of body types. If you have a slimmer upper body this look is going to be super flattering on you. Nudes, blush pinks, gold and shimmer sequins are all very much in trend. These fusion wear sarees are great for a cocktail night or reception night outfit. I think and this is my opinion only, Tarun Tahiliani seems to have taken an oath. That anyone who walks into his store has to empty his pockets before leaving. There are so many amazing designs in this new collection. One is so spoilt for choice. You want sarees, he has sarees. You want offbeat lehengas, he has those too. Floor length anarkalis, sherwanis, fusion wear, check-check-check. The designer has gone all out showing his skill to the t, and I am loving it. It’s not an easy feat to pull off 70 unique designs for a show and successfully doing that as well. Absolute respect.